“A Doll Named Keturah” from the show “Barbara Swan: Reflected Self” at Danforth Art. FRAMINGHAM — Many people plugged into the Boston cultural world in the last 50 or 60 years will want to see “Barbara Swan: Reflected Self” at Danforth Art because Swan, a portraitist, painted family and friends. It’s like a reunion. There’s poet Anne Sexton! Luise Vosgerchian, beloved professor of music at Harvard! Painter Bernard Chaet! And there, as babies, are Swan’s children — Aaron Fink, now a successful painter himself, and Joanna Fink, director of Alpha Gallery, depicted with an intimacy and directness that seems loving yet pragmatic. Swan, who died in 2003 at 80, deserves examination. In the 1940s, she studied at the School of the Museum of Fine Arts with Karl Zerbe. The Museum School then was a hotbed of Boston Expressionism, a style known for its brilliant, brushy colors, its attention to matters of spirit and psyche, and its adherence to figuration even as abstraction swept the art world. Because of her academic origins, early paint handling, concern with the figure, and tart color sense, we might categorize Swan as a Boston Expressionist. But her early work, from the 1950s, is less tortured, less concerned with the upheavals of life, than that of proponents of the style such as Zerbe and Jack Levine. As a portraitist, Swan focused on her subjects rather than her own neuroses or spiritual dilemmas. That came later. The show, organized by Danforth Art’s assistant curator, Jessica Roscio, follows certain through-lines in Swan’s career, notably the concerns and negotiations of being a woman artist in the mid to late 20th century. Roscio suggests that feminine and domestic themes, though not discussed, were more accepted by the Boston Expressionists than by the generally more machismo Abstract Expressionists. But the show hinges on the incisive portraits; Swan conveys a great deal with very few, graceful lines. There’s a particularly telling early pair of the artist and her mother, on pages that faced each other in her sketchbook: “Portrait of the Artist’s Mother (Clara Swan)” depicts a stern, solid older woman, arms crossed and head tilted. Her eyes penetrate. A smile — of satisfaction or triumph — begins to play on her lips. In her self-portrait, Swan’s shoulders slump, her eyes are weary. She looks defeated in her mother’s gaze. Swan always began with the eyes — so her husband, Alan (Alpha Gallery’s president), told Roscio. You can see it in many portraits. The eyes anchor all else. Before feminists theorized about the gaze, Swan was already turning it back on the viewer through the astute eyes of the women she drew. Those who don’t directly appraise us turn inward — you can see it in a drawing, inventively composed from above, of artist Lois Tarlow. In the painted portraits, Swan sometimes works too hard, as if she hasn’t found her element. Even vibrant colors feel muddy; forms, especially bodies, lack the crisp energy seen in her drawings. But then we get to those baby pictures. In the drawing “Joanna and Aaron,” the exactness of detail eschews sentimentality. 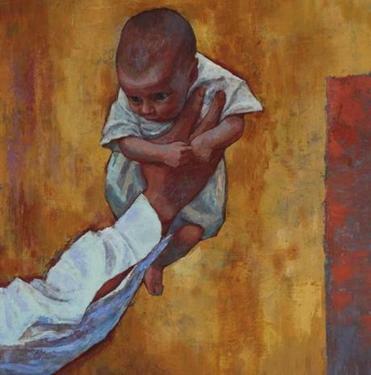 The painting “Baby (Aaron at 4 Months)” has the infant riding in his father’s upraised hand, eyes wide with that strange combination of alertness and total unknowing that characterizes a baby’s gaze. His skin is all reds and gray-blues, and the background like burnished copper. The painting glows and coheres. Barbara Swan’s “The Nest’’ at Danforth Art. There’s also a terrific overhead depiction of a babe nursing at his mother’s breast in “The Nest,” in both a sketch and a painting. Here the painting outdoes the drawing, as Swan jiggers the composition and repositions the mother’s hand. Over time, Swan’s paintings grew less brushy, less expressionistic — but more succinct in execution, like her drawings. She took to working on still lifes. These, Roscio suggests, were a kind of self-portrait, in their investigation of the feminine and their use of objects that held intimate meaning for the artist. They’re also examinations of perception, as images reflect in and refract through glass bottles. Those objects — art historical reproductions, images from pop culture, dolls — represent ways women have been depicted through time. The bottles bend and fracture these symbols of femininity. In “A Doll Named Keturah,” Swan positions a treasured, Victorian-era doll and three bottles before a print of Edvard Munch’s “Girls on the Bridge.” We see one girl’s disaffected face, and the hallucinatory swirl of water and shore beyond. The doll looks stiff and overwhelmed, cloaked in black. Leaning against a bottle, she fractures and she doubles. She’s riveting, and yet somehow a throwaway, at the edge of the painting. In the background, a hand holds a paintbrush to a canvas — as if the artist is looking in a mirror, painting a self-portrait. If so, she’s putting her inner life to paint, revisiting a strain of Boston Expressionism, and revealing some of her own twists, cracks, and vulnerabilities. 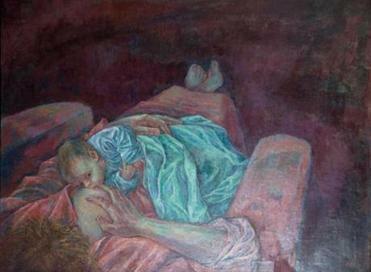 Swan painted “A Doll Named Keturah” in 1981. In the manner in which it unpacks images of femininity, it’s a relic of its era. Still, there are enough uncertainties in it — particularly in the haunted face and posture of that doll — that it’s no pat feminist palaver. It says something about the artist, and her understanding of art and herself. Looking at these things, she finds a hall of mirrors. And that, today, continues to compel.